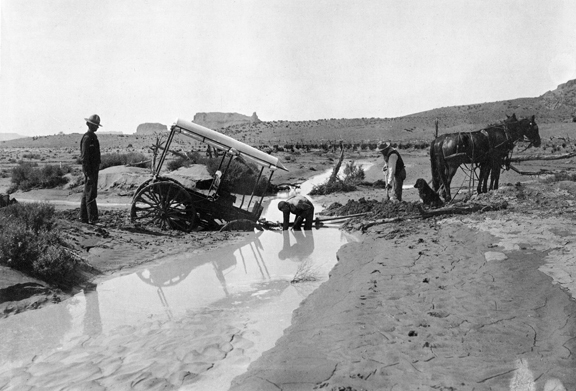 "It doesn't look that deep," is probably what the men in this photo thought before they attempted to cross a deceptive stream on the Navajo reservation. Photo is by Adam Clark Vroman, 1901. "Something that happened on the trip," it says on the back. They were evidently on the way to Walpi and Tewa, both Hopi towns, at that time a remote part of Arizona. Vroman died in 1916 and his photographs were forgotten until Lawrence Clark Powell, then librarian at U.C.L.A., initiated a search for the lost negatives in 1953. The search was successful, saving some real treasures. 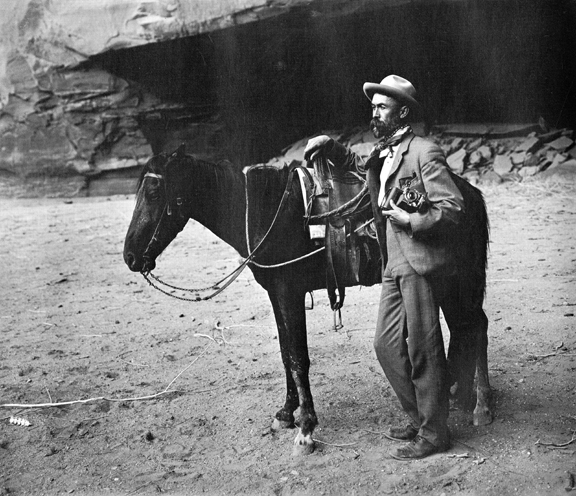 Part of his impressive collection, including these two photos, is on display in a book I own called, "Photographer of the Southwest: Adam Clark Vroman, 1856-1916." Published by Bonanza Books out of New York.